We have done this video and our last video “Kent – Detling-North Downs Way-Pilgrim’s Way-Thurnham on request for David Seager from New York, USA who’s Great, Great Grandfather, Edward, lived in Thurnham and was buried in Otham churchyard. Otham is a small narrow village close to its county town of Maidstone. The village, with wonderful views of the North Downs, is sort of spread out with a war memorial at one end, the White Horse Inn at the other end and the Church of St. Nicholas two fields away. The village houses a number of medieval and listed buildings. The 12th century parish church of St. Nicholas had chapels added to its north side in the 14th century. It is a Grade I listed building mainly constructed with uncoursed stone and tufa rubble and the steeply pitched roof is covered with clay tiles. Otham Manor is a late 14th century manor house, built around 1370, was previously known as Wardes. It was altered and extended with a south wing in the 16th century and restored in 1912 by Sir Louis Mallet who added an extension to the southern wing. This L-shaped two storey timber framed hall house is a Grade I listed building. Synyards is a late 15th century house with additions made in the 16th century and in 1663. It was restored in 1905 by P.M. Johnstone and this mainly two storey timber framed hall house with a steeply pitched plain tile hipped roof is also a Grade I listed building. Stoneacre is a small National Trust property of 15th century and is a half timbered yeoman’s house with a small garden, orchard and meadows. It is a private residence but is open to the public on Saturdays and Bank Holiday Mondays from mid March to the end of September and is a Grade II listed building. Broomfield is a small village and forms part of the civil parish of Broomfield and Kingswood and is twinned with Broomfield in Colorado, USA. There is also a Broomfield on the outskirts of Herne Bay in East Kent. The village is situated on the River Len, a tributary of the River Medway, just upstream from Leeds Castle. The village church dedicated to St. Margaret is a beautiful church located on a hill overlooking the valley. It is a Norman church with later alterations but a north window commemorates that the church was restored in 1880. The organ was built in 1890 by Henry Jones and today is still pumped by hand and the church contains the fine arms of the Wykeham Martin family, who once owned Leeds Castle, including the eponymous bird. There is also a certificate just inside the church confirming that the old yew tree just outside the entrance to the church is 1,000 years old also just in the porch way there are a number of photograph’s of the well dressings that are held every year at the Holy Well which is just outside the gates. We were told by the verger that Lord Fairfax, the Wykeham Martins and a famous cricketer who died in 1898 are all buried in this graveyard and that a cat had her kittens down in the crypt and she brought them out one by one and they all lived. We would like to thank the verger very much for sharing his knowledge and for showing us round his church where he was actually christened at the Victorian font. On the other side of the road opposite the church there is the old army barracks and they once housed the hop pickers of Kent. Leeds is a village in the Maidstone district of Kent not far from Otham, Broomfield and Leeds Castle. The village church dedicated to St. Nicholas, a Grade I listed building, has the second largest Norman tower in England and the site of Leeds Priory which was dissolved in 1539 is a scheduled monument. The area of Caring located between Leeds and Otham has a number of modern farmhouses in the style of an Oast house and the old Vineyard is a free tourist attraction. 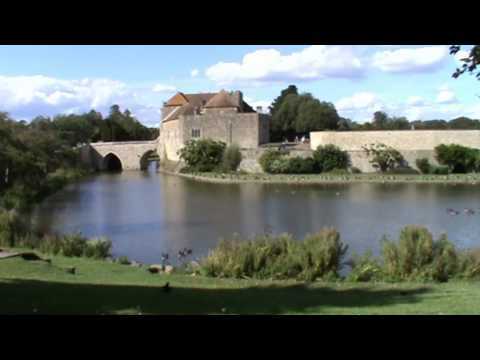 Leeds Castle also in the Maidstone District of Kent is the most magnificent and beautiful castle dating back to 1119 but the castle as it is seen today dates mostly from the 19th century built on islands in a lake formed by the River Len. The castle was first built of stone by Robert de Crevecoeur a Norman baron in the reign of William the Conqueror’s son Henry I on an island in the River Len as a Norman stronghold. The castle descended through the family until the 1260’s but it was rebuilt and transformed over the centuries that followed. In 1278 it came into the possession of Queen Eleanor of Castile the first wife of King Edward I and it became Edward’s favourite residence. Leeds Castle has played many roles through the centuries it has been a Norman stronghold, the private property of England’s Medieval Queens, a place used by Henry VIII and his first wife Catherine of Aragon, a Jacobean country house, a Georgian Mansion, an elegant early 20th century retreat for the influential and famous, and in the 21st century it has become one of the most visited historic buildings in Britain. Leeds Castle was owned by Robert Fairfax for 46 years until 1793 when it was then passed on to the Wykeham Martins who repaired and remodelled the castle to a Tudor style which was completed in 1823 and still has the same appearance seen today. The last private owner was the Hon. Olive, Lady Baillie and whilst in residence during World War II the castle was used as a hospital and Lady Baillie and her daughters hosted burned Commonwealth airmen as part of their recovery. Upon her death in 1974 Lady Baillie left the castle to the Leeds Castle Foundation a private charitable trust whose aim is to preserve the castle and grounds for the benefit of the public. The castle set in 500 acres of beautiful parkland was opened to the public in 1976 and is the perfect place for a day out. The castle is open all year round with heaps to do. Tourists and visitors of all ages can explore the castle and the gardens, get lost in the maze made with 2,400 yew trees, visit the grotto or the world’s only museum of dog collars, take a game of golf, watch the children let off steam in one of the playgrounds, watch a falconry display, take a ride on Elsie the Castle Land Train or the Black Swan Ferry Boat, browse the shops for unusual gifts and souvenirs, have lunch at the Fairfax Restaurant or just sit and relax with an ice-cream or picnic the choice is yours. The castle was first listed as a Grade I listed building in 1952 and recognised as an internationally important structure. Leeds Castle was one of 57 heritage sites in England to receive more than 200,000 visitors in 1998 and was a shooting location for the 1949 film Kind Hearts and Coronets. We park near the War Memorial in Otham and walk downhill on the lane sign posted Stoneacre. At the bottom of the hill we cross over a ford and keep following the track round to the right passing Stoneacre the National Trust property and Stoneacre Farm. We keep heading forward on the track following the blue arrow with high hedges and fruit orchards on both sides until we come to the road. We turn left onto the road then at the t-junction we turn left, sign posted Leeds, at the next t-junction we bear right along Avery Lane. At the bend in the road we head through the hedge following the public footpath sign into a field of strawberries. We head forwards between the plastic tunnels and the path becomes a tarmac track which takes us to the road. We turn left then immediately right and follow the track straight forwards with the tall hedge on our right and the fruit crops on our left. When the track turns left we turn right through the gap in the hedge then you will see the yellow arrows we turn left and follow the path through the arch of trees towards some houses until we come to the road at the bottom end of Leeds village. The pub opposite has closed down. We turn right along the road for a short way until we reach the last houses on the right and turn left at the stone footpath sign almost hidden by grass into the field. We head straight forwards over the field until we come to the road. We turn right and then left at the t-junction then pick up the footpath on the left just before Park Barn Farm. We bear right round the back of the barn and cross over the field heading for the two telegraph poles in the right hand corner. At the corner we turn right into the trees and zigzag through a garden to the road. We turn left onto the road taking us into the village of Broomfield. We see the old army barracks on the left and we turn right, with a holy well just to the right, to take a look in Broomfield’s church of St. Margaret and around the churchyard on the right. We then continue on the road and just after the sign post Broomfield and Kingswood twinned with Broomfield USA we go through the gap in the hedge on the left at a public footpath sign into the wood. We follow the little path through the wood and after crossing a little bridge and through a gate we come out into the open next to a lake with wonderful views of Leeds Castle and grounds. We keep heading forwards following the path at the side of the lake going through a gate and turn right across the end of the lake to take a look at Leeds Castle. Walkers are allowed through the grounds on the public footpath for free but for all the attractions you must purchase a ticket. After a look around we make our way back across the end of the lake and head forwards bearing slightly right on the tarmac track following the footpath sign until we come to a cattle grid. We turn right and follow the well marked grass path through the field bearing right when the path nearly meets the tarmac track. We go through a gate to the right of a house and head straight forward until we meet a minor road. We cross the road and head forwards over the field to go through a gate to the left of the church spire we can see in front of us. We head forwards through the churchyard keeping to the left of the church which brings us out onto the main road at the top end of Leeds village. We turn left past the George Inn and follow the road round to the right and after passing the Manor House on the left we take the footpath on the right next to the railings and walk down the side of a white house. We follow the track until we come to a minor road and cross straight over into a field using the stiles. We cross the field to the minor road cross over the stile and turn left and follow the minor road until we come to a t-junction. We take the track just slightly to the right and follow the public footpath straight forwards with the hedge on our right through the pear orchard until we come to a gap in the hedge with a public pathway sign on the ground we go through the gap and walk between the raspberry canes until we come to a track. We turn right and just before the shelter we turn left through the hedge and turn right and follow the track with the hedge on our right and more raspberries on our left. When we reach the t-junction we turn left then almost immediately we turn right over the stile going through the grass field downhill to the bottom where we turn right onto the tarmac track we started on and walk uphill back to Otham. This is an easy mainly flat walk through orchards, fields and along tracks and minor roads. Approx 7 miles allow 2 hours 45 minutes using OS Explorer map 148, Maidstone & the Medway Towns. Start point: Otham War Memorial. Leave the M20 at junction 7 and take the A249 towards Maidstone. At the next roundabout take the first exit then take the next right turn and follow road to end. Turn left onto the A20 through Bearsted for approx 1 ½ miles and take a right turn for Otham on a minor road. There is road side parking near the War Memorial or there is a Natural Trust car park down the lane towards Stoneacre. There are public toilets and refreshments at Leeds Castle half way round the walk. For refreshments in Otham just on the outskirts of the village there is the White Horse pub and in Leeds village there is only one pub now the George Inn, the Ten Bells has closed. The next nearest toilets are in Maidstone and for refreshments there is a lot to choose from in Bearsted and Maidstone. I found your website by trailing through the internet as I wanted to gather as much information as possible on Otham, my home village. I thought it may be of interest to you that Golding Homes have proposed a housing development of 5,000 homes on a 350 acre site at Otham and Langley which complety encircles Avery Lane (my home) which is highlighted on your map. This will completely destroy all our green fields and cause untold unreparable devastation to the existing home owners and surrounding villages if planning is approved. I just wanted to share this with you, mainly because you wrote such a nice description of the walk and took lovely photos which may become just a memory. we were hoping that both the walks would somehow show David what Edwards life was like between 1846 and 1892. When we explained to the locals what we were trying to do whilst we were filming they were very helpful and friendly giving us pointers on what to look for. We found the area of Kent where you live while we were doing our walks very beautiful and peaceful, some of the buildings are outstanding. We enjoyed our short time in Kent very much. The effort to encourage the natural wildlife to help in the fruit production is fantastic and to think that some of this and the areas natural beauty could be lost is very sad. Lets hope they do not build on your fantastic countryside. I would like to get in touch with David Seager of new York who requested this information. I am a great, great granddaughter of Edward Seager. thank you! Hope you keep looking at and sharing our website. Really enjoyed this walk which my partner and I completed this afternoon. The directions were spot on. We normally get lost at least once but not today. Very interesting walk with some great views plus the lovely Leeds Castle. Looking forward to trying some of your other walks.